The secret’s out in my local congregation: I’m a nerd. So much so that now my own church members (some of whom are unaware of this blog) are sending me geeky theological stuff. Excellent! 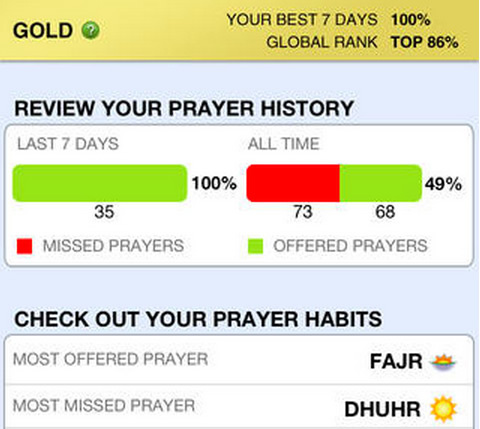 Get accurate prayer timings and log your prayers! Athan app will help you achieve prayer discipline in your busy life by providing a fun and easy way to track your prayers. Every time you log your prayers, you increase your score, unlocking badges and achieving elite levels along the way. The application offers timely reminders for prayers, tracks your offered and missed prayers, and includes valuable location based tools such as finding the qibla direction and directions to nearby mosques. Fascinating! I am relieved that folks of other faiths–especially those in the tradition of Islam who take daily prayer very seriously–have troubles with regular prayer like I do. We see game theory (the use of mechanics of motivation as found in games) in all aspects of our lives. From Weight Watchers that tracks weight loss in a communal effort to the FitBit bracelet to research that playing Tetris reduces food cravings, gamification is a prolific approach to motivating changes in behavior for a world without personal discipline (including this blogger). I worked for a Youth Group that used H.A.B.I.T.S. by Doug Fields where each letter stood for a different spiritual practice (Bible Memorization, Involvement, Tithing, etc). The goal was less competitive than holistic: one needed to work on each habit and fill them out like a Bingo card every week. My church has a Sunday School class that has made it into a communal effort: when the entire class has a certain number of points (attendance, participation in class, etc) then their class gets a pizza party or some other benefit. This was done with clear discernment by the teachers that discipleship is not a competition but is a collaboration (which is still game theory). I haven’t seen studies that tracked whether people that participate in gamified spiritual practices maintain them better or worse than those without such motivation techniques. That would be interesting research to about 10 people in the world. People outside a faith tradition who nonetheless wish to try out the practices of a faith. In short, the question is that until a spiritual discipline is internalized and has strong intrinsic motivation, what methods are acceptable for a follower of a faith tradition to utilize? Can they make their daily prayer into logs onto a competitive app? Can they give themselves a cookie after reading a whole book of Scripture (nuh uh–you have to read all 1-4 John)? Does the end result of a spiritual practice justify the means to get there? Should spiritual practices be subject to gamification like any other behavior? Or does the “leveling up” or competitive/collaborative aspect diminish the ultimate goals of a spiritual practice? Cool topic. Interesting to think about how the reward systems used in video games, etc. could improve prayer life. One note of correction: “game theory” does not equal “the use of mechanics of motivation as found in games”. What you’re talking about here is more akin to “token economies” and other methods of operant conditioning. Game theory is better defined as “the study of mathematical models of conflict and cooperation between intelligent rational decision-makers (or how those decision-makers are often not rational or intelligent)” (from Wikipedia). I would love to see a post about THAT, and tying it to issues of the church re: consolidation of local churches, making tough legislative decisions, etc. Thanks for the comment, Devin. That’s an interesting definition of game theory that I haven’t seen before. Do you have recommended resources that use that definition? Thanks for the clarification on token economies! I didn’t find a good resource in a quick search online, many get into more detail and complicated aspects than are useful (for me anyways). Remember the movie; “A Beautiful Mind”? John Nash won a Nobel prize for pioneering mathematics of ‘Game Theory’ re: Nash Equilibrium. Complicated stuff. The most accessible application of Game Theory is the prisoner’s dilemma. Here are a couple links on that. Actually that’s the only real definition of game theory. It is a long and storied approach to practical problem solving from politics to economics to marketing to social interaction. What you’ve offered is simply making an game out of something, not involving any real theory at all. Which is fine! It’s a good thing, just not game theory. You can find an introductory discussion of game theory on Wikipedia. For something more involved, on iTunes you can get an entire free Ivy League course on Game Theory, in audio or video form. It’s good stuff. I enjoy your blog! Keep it up. Glad I decided to forward you the link. I wasn’t sure given how much you have on your plate and had no idea you had this blog. I as a geeky PK I look forward to reading it (added to my RSS just now). I agree with the others about the use of the term “game theory.” So much so that I might even think about retitling the post. Partly because the approach of the app is basically behavioral psychology, which, as I understand it, is the starting point for behavioral economics. That branch of economics argues key fundamental assumptions of the game theoretical approach, such as rational actors with clearly ordered preferences, are wrong. Game theory is pretty influential (and controversial) in political science. I had to take a seminar on it in graduate school and it was part of one of my qualifying exams, so if you’re ever curious about what it is and its merits and shortcomings (as I see them) we can chat about that. I think the question of incentivizing faith is a great, rather or not it falls under game theory. Certainly it is important to make sure we understand what the primary end is (winning the game or growing in our faith). I also worry when we try and “trick” ourselves or others into faith. It seems there could be a long term danger there. While the game side can seem fake, I think we kid ourselves if we think we pursue faith purely for faith’s sake and not some other reasons like social appeal or personal gain.